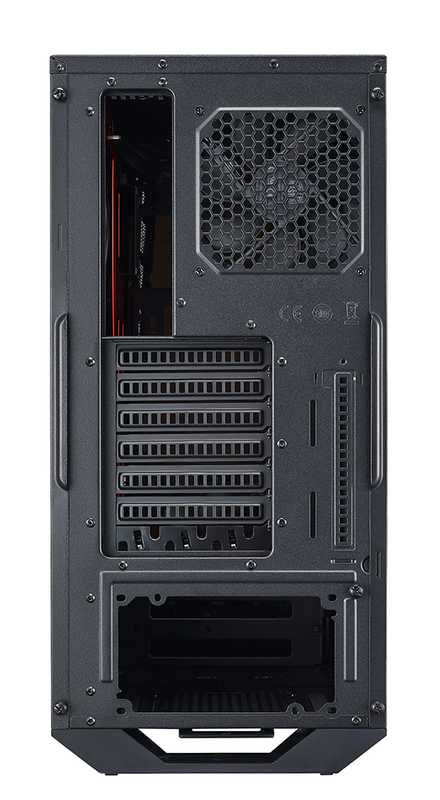 Cooler Master is expanding its range of chassis solutions with the introduction of the MasterBox 5t. 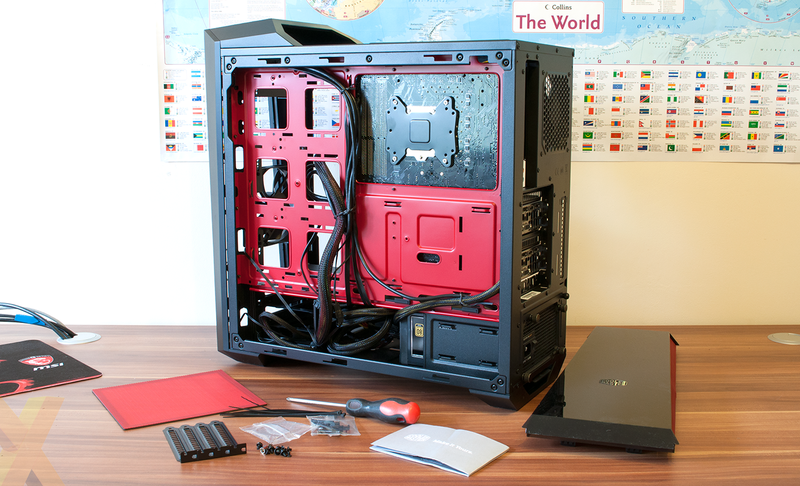 The name sounds a little clunky, yet we've been impressed with the firm's recent MasterCase efforts and we're intrigued to see whether or not the more affordable MasterBox can keep up the good work. Priced at £75 and arriving in UK stores starting today, the new addition is essentially a tweaked variant of the existing MasterBox 5 (£60). 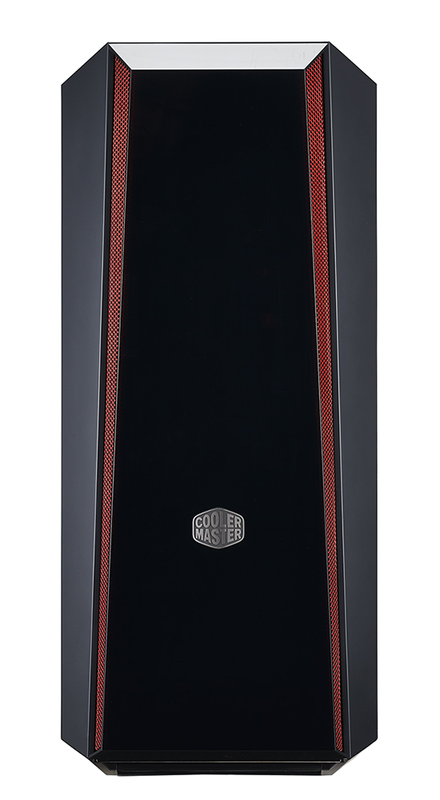 This time around Cooler Master has opted for a 'gaming' aesthetic, with a red-on-black colour scheme and an angled exterior designed to appear more aggressive. 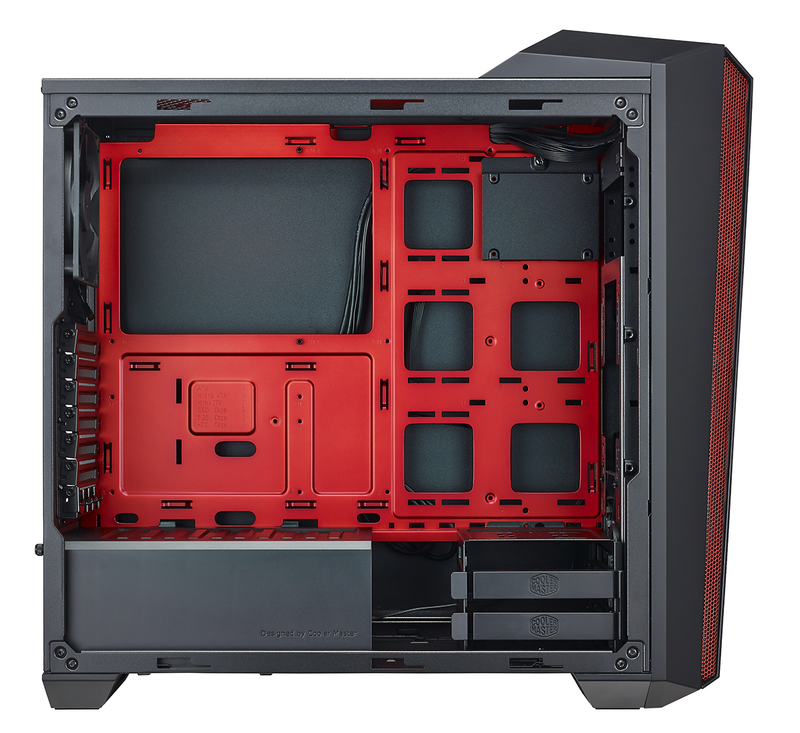 Right off the bat the MasterBox 5t is an acquired taste, for while the original MasterBox 5 was reasonably streamlined, the 5t adopts a pointed Sandcrawler-type stance with red accents on the front, top and interior that are coloured to tie-in with gaming motherboards from the likes of Asus or MSI. In case you're wondering what the 't' in the name stands for, we're told it's short for turbo, though the branding doesn't appear to correlate to any particular feature. Exterior dimensions of 514mm (H) x 220mm (W) x 541mm (D) are above average for a mid-tower frame, and at first glance it isn't immediately obvious what new features the MasterBox 5t brings to the table. Look closer and the first noteworthy addition is visible on the I/O panel, where a fan controller now sits alongside the dual USB 3.0 ports and audio jacks. Offering a choice of two speeds - high or low - it can control a trio of three-pin case fans and may help keep noise levels in check. 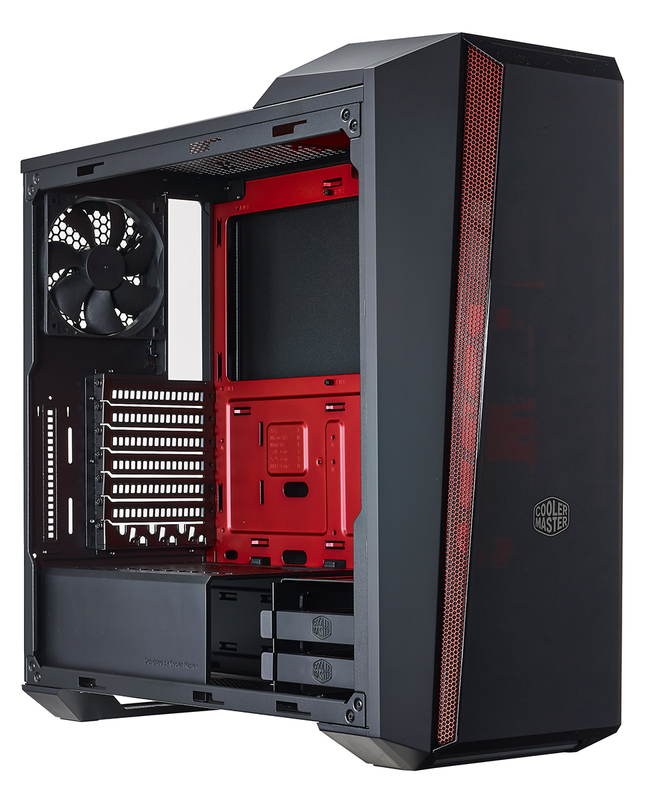 What's useful for LAN-going gamers is that the top angular accent doubles as a carry handle, which Cooler Master reckons can support a weight of up to 30kg. Build quality is decent throughout, though the plastic, glossy and easily removable front panel doesn't feel quite as robust as the rest of the case. From a feature perspective, it's no surprise to find that the MasterBox 5t has plenty in common with the existing MasterBox 5. The internal layout is practically identical, though there are a few small tweaks here and there. 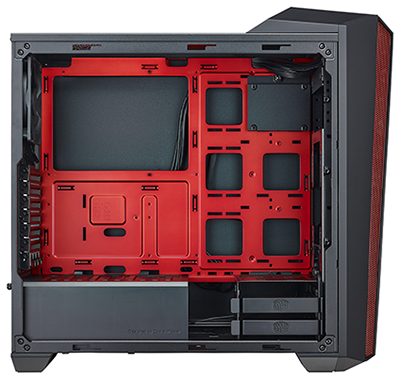 The motherboard tray, first and foremost, is painted red and a top exhaust vent lined with a red mesh filter has been added to facilitate another 120/140mm fan. There's a good amount of room to work with and the MasterBox 5t easily swallows up our dual-GPU, ATX platform. Mini-ITX and Micro-ATX motherboard form factors are also supported, but given the size of the frame and the amount of room available, we're surprised to find that there are no 5.25in optical bays. While we appreciate that smaller cases often eschew disc media in order to keep dimensions down to a minimum, we see no obvious reason for a chassis of this size not to include at least one available 5.25in tray. 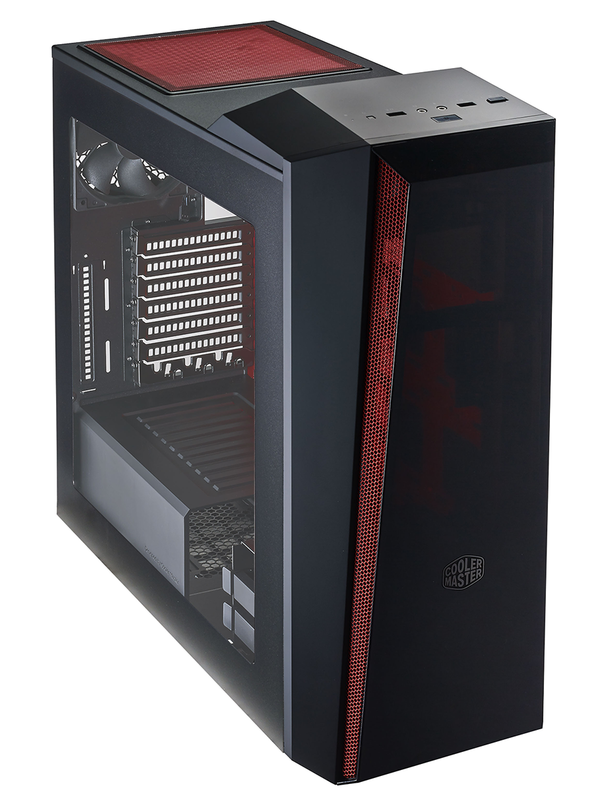 Storage on the whole doesn't appear to be a priority, as the mid-tower case offers only three bays in total - two caged 2.5/3.5in trays and a single 2.5in SSD tray. These can be removed and relocated independently to free up space for liquid-radiator paraphernalia, and there's ample potential on the cooling front. Just the two three-pin fans are included as standard - a front 120mm intake and a rear 120mm exhaust - yet the area behind the front panel can accommodate dual 140s or a trio of 120s, making it an ideal spot for a large 280mm or 360mm radiator. Up to 35mm of space behind the motherboard tray leaves plenty of room for cabling, however it's a shame Cooler Master hasn't filled at least some of the cable-routing holes with rubber grommets. As it stands, it isn't easy to keep cables hidden from view, and the MasterBox's lower-price positioning is evident elsewhere, too. 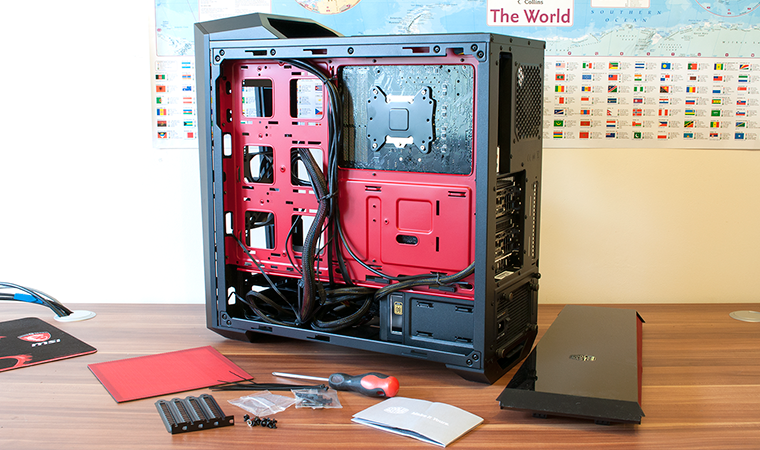 The expansion slots are held in place using standard screws as opposed to thumb screws, the PSU shroud has to be removed in order to get the supply in, and you'll need a few extra PSU cables than normal. This is because the fan controller is powered by old-fashioned Molex, while a red LED bar lining the bottom of the front panel needs a SATA power connector in order to light up. The MasterBox 5t isn't built to innovate, but if you happen to be partial to the exterior design, there's enough potential at the £75 price point. 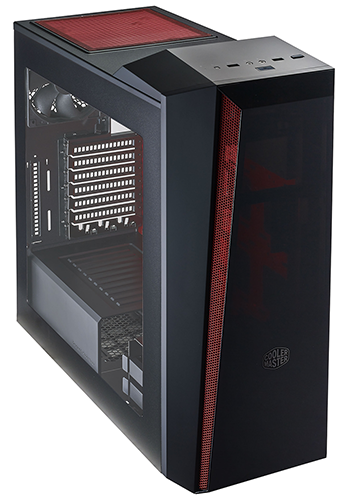 Generous clearances include 167mm for a CPU cooler and 410mm for graphics cards, and the basics - a pull-out filter beneath the PSU bay, a large cutout in the motherboard tray for cooler installation and a good-sized side window - are present and accounted for. 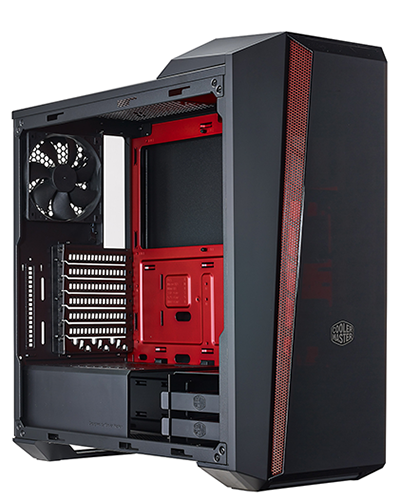 Whether or not Cooler Master has done enough to warrant a £15 premium over the standard MasterBox 5 is up for debate, so let's examine performance before we reach a conclusion.